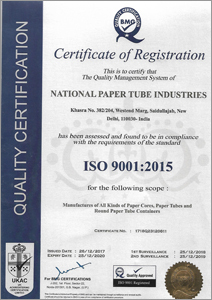 National Paper Tube Industries is a trusted company engaged in offering a vast collection of Cores and Tubes. Our range includes Paper Packaging Tubes, Spiral Paper Tubes, Paper Core Tube, Kraft Paper Tubes, Industrial Paper Tubes, Plastic Foil Paper Tubes, Carpets Paper Tubes, Textiles Paper Cores, Paper Cores, Aluminum Foils Paper Cores, etc. These are used in varied other sectors and applications. We are a trusted Manufacturer, Exporter and Supplier of a huge range of solutions designed from the optimum grade raw materials precisely manufactured by skilled team of professionals. Our talented team of experts and professionals has been employing sophisticated tools as well as technology according to the national and international quality norms. Owing to state-of-the-art infrastructural base and manufacturing unit, we have been developing quality assured range in different specifications and sizes. Our well equipped unit has high technology production machines and tools that effectively help us to meet bulk demands of the clients within the decided time frame. With quality-approved products, ethical business practices and honesty, we have carved a niche in the market as a preferred vendor. We have established a sprawling Research and Development Unit for smooth business operations to attain huge success in the market. The unit effectively supports us towards the development and innovation of novel products. The unit enables us to carry out production of bulk products with novel features at a very large scale to smoothly meet the ever-changing demands of esteemed customers within promised period of time. We have been offering matchless solutions after conducing strict market surveys from time to time.